Paneltex was the first converter of temperature-controlled vans to undergo the exacting process of becoming a Qualified Vehicle Modifier on the Ford QVM programme. Our panel van conversions of the Ford Connect, Custom and Transit are done either in our specialist Somers Panel Van conversion facility in Norfolk, or in our main facility in Hull, so the QVM status extends over both of these production sites, with us holding two Ford QVM certificates. As the first company awarded QVM status for temperature-controlled conversions, the quality of Paneltex’s refrigerated Ford vans and freezer vans is evident. Paneltex offers a wide range of multi-temperature, frozen and refrigerated Ford vans and conversions and, as an approved vehicle converter, we are well positioned to offer our high quality conversions. 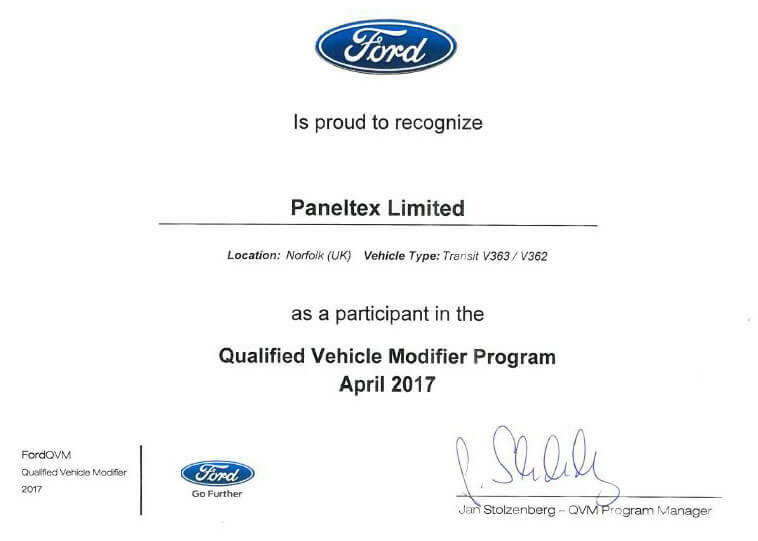 The Paneltex Ford QVM certificate awarded to our team in Norfolk.